Aaron Glenn’s LinkedIn profile says, “Talk to me about programmable dataplanes.” Yeah. He’s that guy. 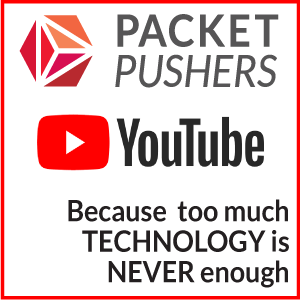 When you watch this presentation from the Packet Pushers Virtual Design Clinic 4 held on March 14, 2019, you’ll catch his enthusiasm for the P4 programming language. Think P4 is sort of OpenFlow 2.0? Nope. Aaron’s gonna smack that idea right out of your head, explaining exactly what P4 is, the chipsets it works with (all about that compiler! ), some use cases for P4, and whether or not the average network engineer needs to be concerned about it. This is a firehose presentation that will drench you with dense information. Watch more than once to get it all.